education | Ayo! Let's go! I recently had the pleasure of sitting in on workshops run by amazing writers and performance poets, held during the Ubud Writers & Readers Festival. This was the second year I’ve volunteered for the festival – it’s a great festival – and the first year that I had the responsibility of organising school workshops. It had its ups and downs but the job was worth it to meet the fantastic group of writers who took part. A few months out from the festival I had to start contacting the writers to tell them about the workshop and almost all of them were delighted to have a school visit as part of their events during the festival. I was worried to begin with, maybe some writers wouldn’t want to give up a whole morning to visit a school? But almost without exception, they did! The hardest thing was negotiating with schools about the visits and making sure both the school and the writer were happy with what was organised. Some schools were easy. They booked one writer for one class and the time was up to us. 9.30 to 12.30? Done. All that was left was to give a list of equipment and resources needed. Other schools were more demanding and wanted the visiting writers to work around their break times or visit the entire primary school in three hours. But, I was amazed to learn, most writers were very amenable and rose to the challenges of multiple groups, or limited time, or larger class numbers. I also learnt that the writers visiting the festival were very hardworking. Zohab Zee Khan, for example, had seven separate events over four days, including two workshops. Another writer, Porochista Khakpour, still had to give Skype tutorials to her college classes in the US, sometimes at 3.30am, while she was at the festival. The best thing for me was I got to meet these amazing writers, and then sit in on their workshops. I tried not to waste my time, either, and joined in as many of the writing exercises as I could. Even Sofie Laguna’s writing workshop with Grade 3’s at the Bali Island School. In total, six schools, four in Bali and two visiting from Jakarta, had workshops with 13 visiting writers, illustrators, journalists, photographers and performance poets. There were 11 workshops in total and, with some of the writers sharing their time among two or three groups, I worked out about 342 students had the chance to be in a workshop with one of the visiting writers. And it wasn’t just the students who enjoyed the workshops. One of the visiting journalists told me it was by far the best thing he had been involved in at the festival. Not surprisingly, the school he visited, the Australian Intercultural School, was rapt with his visit. Next post: what I learnt from performance poets. 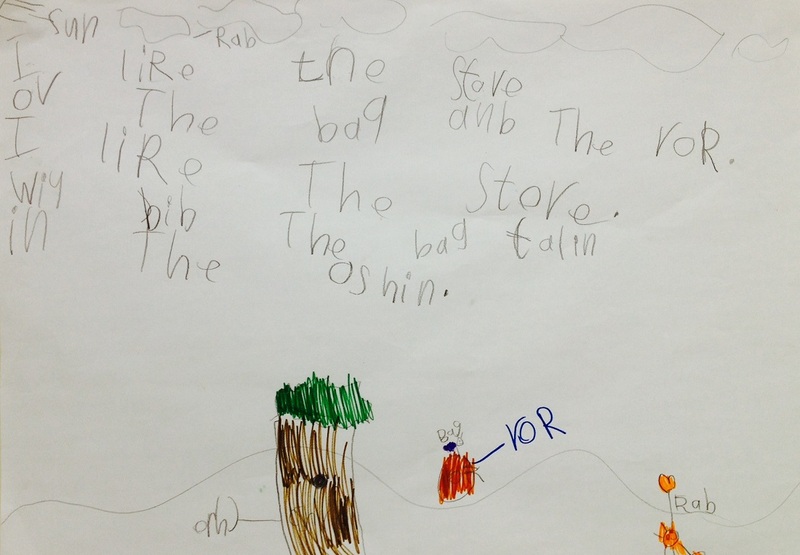 Last week I visited my eldest son’s class to read a story I’d recently written, The Bug and the Rock. I wasn’t sure how they would like it as it is a simple story and isn’t yet illustrated (apart from my terrible pencil sketches). I needn’t have been concerned. The class of five and six-year-olds sat very quietly listening to the whole story, which uses repetition and rhythm to carry the narrative, and then showed they had followed it by asking some questions. 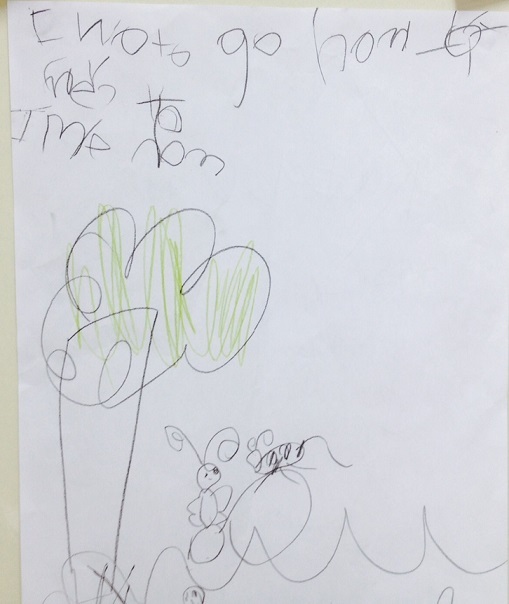 After a short time talking about it, all the kids without exception drew a picture of something to do with the story. 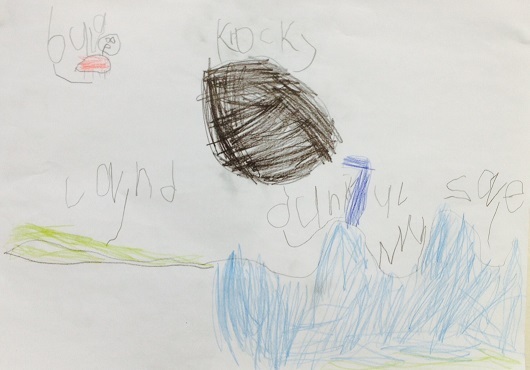 Lots drew bugs and rocks and trees but others took a different approach and drew their own story. 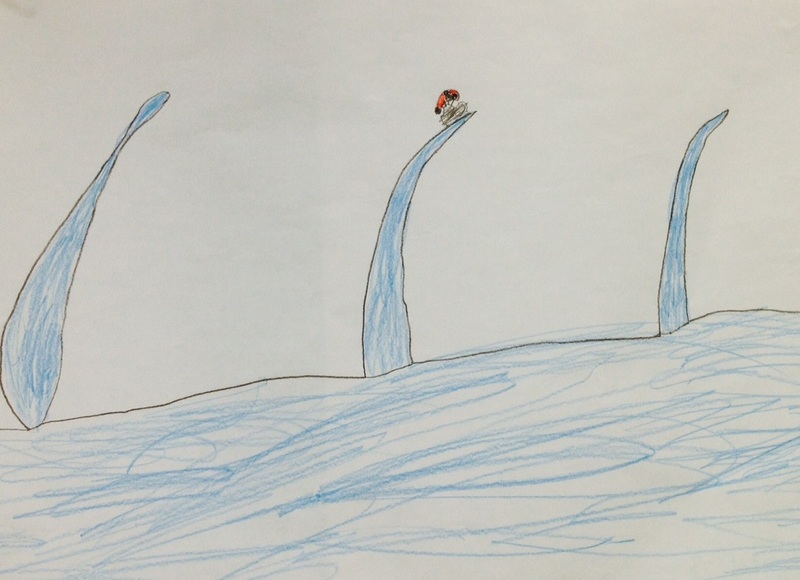 My son attempted to draw, and write the a label for, the barnacle in his picture. It’s the blue thing in the middle. I was curious to see that the bug, crab, rock and tree all seemed pretty easy to draw but not many attempted the featherstar and the barnacle. Without pictures they were forced to remember what these things were, or imagine what they could look like. 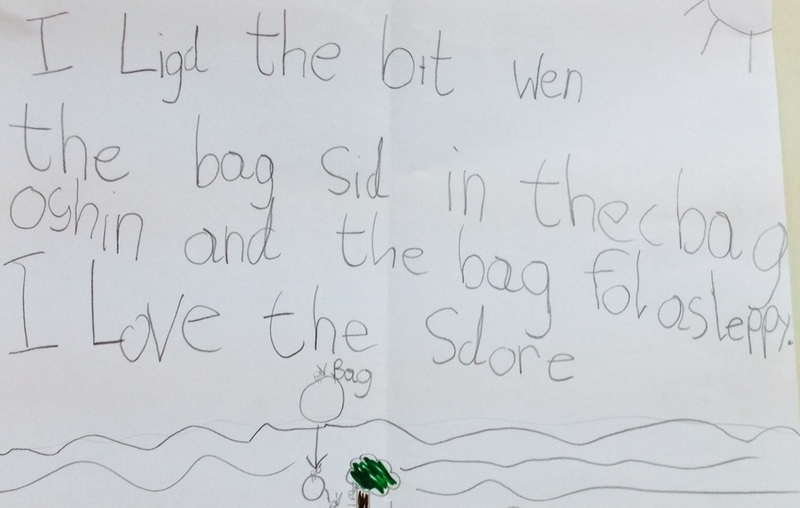 The teacher was particularly pleased that most of the kids wrote something as well, without being asked to do any writing. Some even wrote their own stories in the short time they had. 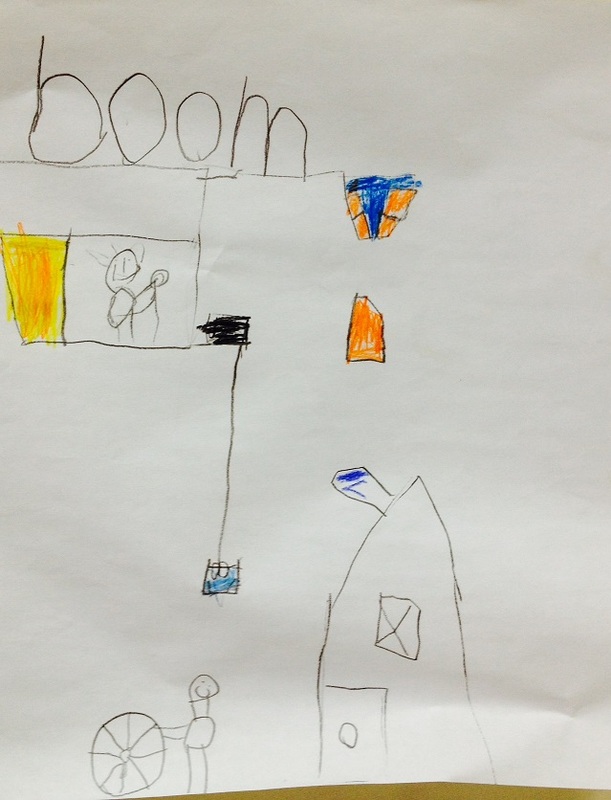 I liked this boy’s alternative explanation for the BOOM at the beginning of the story. In his version, the noise is made by bricks falling on a house. After about 10 minutes, they regrouped and shared their pictures in small groups. We then moved onto the experiment part of the session. Because the rock in the story was pumice that floated on the sea, I brought in some pumice that I had bought in a spa shop for $1 from which I managed to remove the plastic nail brush. I also collected three different stones from my garden and showed them all to the group. With a tank of water in the middle of the circle, everyone made a prediction about what rocks would and wouldn’t float. Of course, only one did and then I explained how pumice comes from volcanos and that the BOOM in the start of the story was from a volcano erupting. I also talked about Krakatau which was very active while we lived in Jakarta and spread quite a lot of pumice in the sea in 2009. I love bringing a practical element into my writing and I was so pleased the kids were so engaged in the experiment. Not to mention, quite relieved that they liked the story! Dyatmika School has a reputation in Bali as the school to choose if you want your children to be bilingual in Indonesian and English. A new Indonesian language literacy program is sure to enhance its reputation even further afield; certainly as far as Australia. Located near Sanur, Dyatmika is a National Plus school which teaches 50 per cent in Indonesian and 50 per cent in English. While their library is well-stocked with literacy books and phonics programs in English, teachers were struggling to find suitable books in Bahasa Indonesia. Undaunted, the school decided to create its own program and appointed one of the long-term primary teachers, Ibu Sri Utami, as the literacy coordinator. 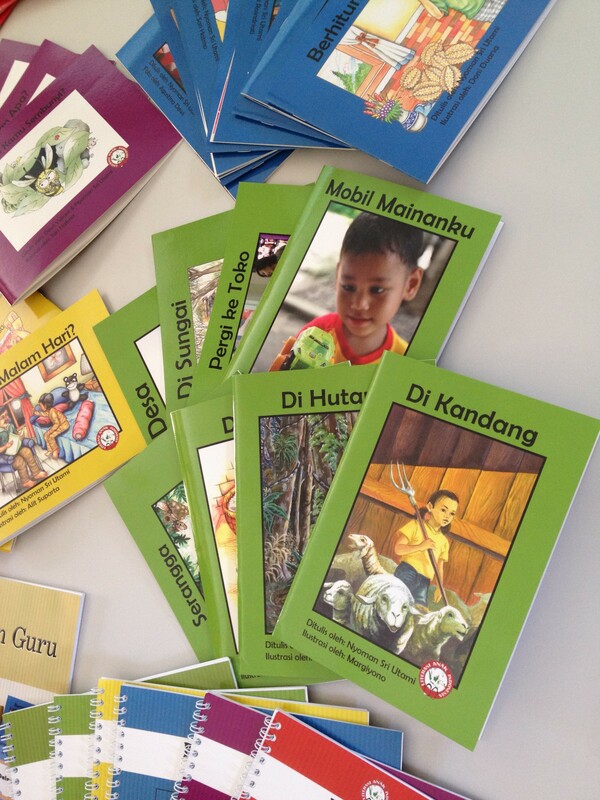 Now in her fourth year working full-time on the program, Utami proudly showed us last week the Literasi Anak Indonesia collection: 57 titles over 14 levels of reading as well as guides for teachers for each book and workbooks for children. Each book, from the simplest story with one word on each page, up to the more complex Year 4 readers, is set in an Indonesian context. Ibu Utami has written each book herself and the illustrations are done by a variety of talented Indonesian artists and photographers. The best part about the program is that Dyatmika School is not keeping their resource to themselves. Quite the opposite. They are hoping to share it as widely as possible to Indonesian and international schools alike. So far, through funds from donors, they have managed to sponsor 20 local primary schools in Bali to use the program through providing the books as well as several days training for the teachers. A friend and I visited last week precisely to see if the program could be used in a pre-school that our kids attend, and also in the early learning centre attached to the East Bali Cashew factory. Ibu Utami was extremely positive and only said training will need to be scheduled for the teachers/carers there. Here’s hoping I’ll be able to post an update early in the new year about this program in those new schools. Where are the picture books? When you think of little children learning to read you think of picture books. This is how children are usually introduced to books in homes in Australia and how they develop a love of books. Primary schools in Australia are full of books and lower-level primary students are read to often. Not so in Indonesia. 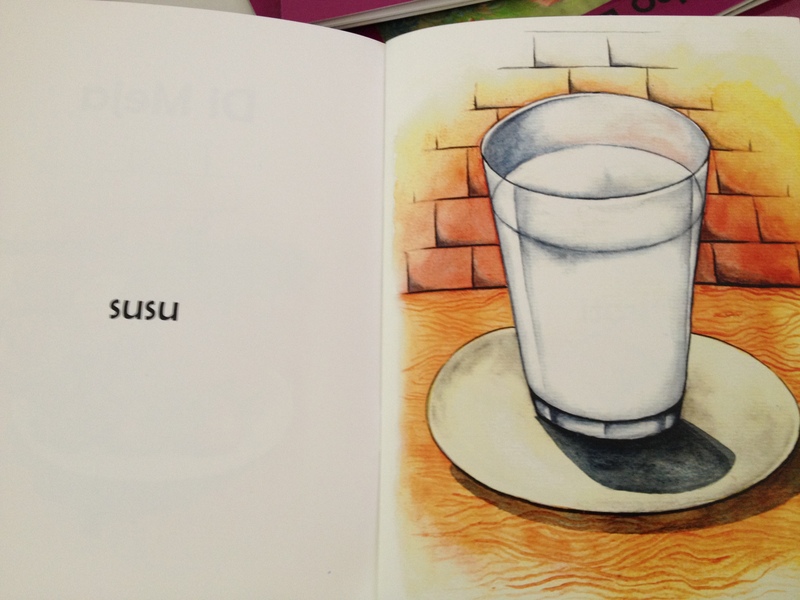 I am told that picture books in Indonesian schools are non-existent. Instilling a love of books must be so much harder with the bare resources that they have. 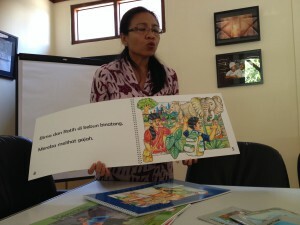 Without a culture of shared reading in Indonesian classrooms, Dyatmika teachers realised that the books had to be accompanied by training so they also teach the teachers about how to share a book with the class – stopping to ask the class questions, creating a discussion around the story and so on. Utami even told us some of the teachers they continue to mentor have changed the classrooms from a very traditional set up with all children facing the front, to different ways of groups, even a circle. All of the readers can be turned into a big book which look fantastic with their bright colours and bold illustrations. As well as the sponsored schools and Dyatmika itself, there are a number of international schools in Indonesia which have begun to use the books in classes where Indonesian is taught as a foreign language, including Green School. The next step is to make the books available to schools overseas, and especially Australia. Unfortunately Utami says the requests to order the books from Indonesian families living overseas can’t be filled yet as they are not yet set up as a publisher. This year the LAI program was turned into a yayasan (not for profit foundation) which means the program can expand, and more people can be involved. Wouldn’t it be great if Australian schools could buy the books to use themselves and then the Australian money could fund the printing of books for more Indonesian schools! I’m sure this program will expand but it would be great to have an Australian hand behind it. Indonesian has had numerous promotions by successive Australian governments to encourage more students to study this language. It was given extra funding in the 1980s and identified as a ‘priority’ language back in the 1990s. This has included incentives for teachers to gain an additional qualification to teach Indonesian in the 2000s. And in 2014, Indonesian was the second language after Chinese to have a flash new resource, the Language Learning Space, developed for teachers. But despite being identified over and over again as an important language for Australians to learn, the study of Indonesian is in decline in Australia. An intervention was even called for in the 2010 report The Current State of Chinese, Indonesian, Japanese and Korean Language Education in Australian Schools Four Languages, Four Stories. This report is referred to in the brand new and still not quite official Australian Curriculum for Languages: Indonesian (February 2014) which, among many other things, has a good overview of the study of Indonesian in Australia. Figures quoted in both these publications date from 2008 on the most part. So, what is the state of Indonesian study in schools in 2008? In fact 63 per cent of all school students studying Indonesian are in primary school. Do more primary schools have Indonesian teachers compared with secondary schools? Or is it that Indonesian is not competing with other languages and subjects that students can opt to study. In primary school subjects are usually mandatory for all students. This is supported by graphs showing large numbers of language learners dropping out of languages around Year 9 when many subjects become optional. Year 7 Indonesian is, more often than not, the first time high school students are learning Indonesian. Even if they have studied in primary school the chances are not great that they will go to a school which also teaches Indonesian. And in that school, if most students are beginners, they may not be able to run an additional stream of Indonesian that is for continuing students. Only about 1 per cent of Indonesian students are learning it in Year 11 or 12. So not surprisingly, anecdotally it seems that most students learning Indonesian in university are also beginners. Numbers of students learning Indonesian in 2008 are double those back in 1994, but that doesn’t tell the whole story. From a peak in 2000 of around 260,000, around 10,000 less students have studied the language each year since 2005. This is matched with schools dropping the program as well. So, retention is low. Let’s place this in the wider context. Only a small proportion of school students study languages at any point in their education which is a challenge that all proponents of language study have to face. Indonesian is the third most taught language in Australian schools. But still only 5.6 per cent of the total student population studies Indonesian. Unlike 163 other countries in the world that have more than one official language, Australia is a firmly monolingual country. There are isolated pockets of bilingualism – think Vietnamese and Italian in parts of Melbourne, Arabic and Chinese in parts of Sydney, but we are pretty hopeless when it comes to learning other languages. All governments seem to agree that more language learning is important for Australia. The latest government has acted by increasing the numbers of language curriculums from 11 to 16 and adding, among others, Latin and Classical Greek. Will this help all languages though? Or spread resources more thinly for ‘priority’ Asian languages such as Indonesian? If the aim is to encourage more students to take a language in Year 12 by offering more choice of language, I’m not convinced this strategy will work. The other publicised move by this present government is the New Colombo Plan which aims to send thousands of Australian undergraduate students to Asian countries as part of their degree. As the Vice Chancellor of Sydney University points out, we can’t send them with no language training or cultural awareness skills. So will this plan (planned to last at least five years) be an incentive for high school students to study an Asian language? It remains to be seen. One encouraging example is that of a NCP scholar training at Sanata Dharma University in Yogyakarta to become an Indonesian teacher on her return to Victoria. More examples like her could naturally lead to more high school students wanting to take the language in order to have this travel opportunity in front of them. Even with the figures of schools with Indonesian programs we can’t be sure all these students were learning the language per se. In 2007 there were 306 primary schools with programs in Indonesian in Victoria and NSW. But it is suggested that a third of those might have included Indonesian in language and cultural awareness studies, rather than classes that aim for language proficiency. The Australian Curriculum promotes language study be done through an intercultural focus. This raises questions like, ‘will students be actually learning the language or just about the culture?’ Give it a few years and I’m sure there’ll be a study that will say, but there is a lot of good stuff to say about the Australian Curriculum – enough for a separate article at least. Do we know what is being taught? This is where the Australian Curriculum is so valuable. It has a wealth of information about what should be taught and recommends tools and resources to use. It also specifies what learners should be able to do in the language year to year in terms of achievement level. And finally, how about the global context? Australia is, according to the Four Stories report, the only Western country to support the teaching of Indonesian in schools. That makes Australia very significant in terms of pedagogy and providing an example to other countries. 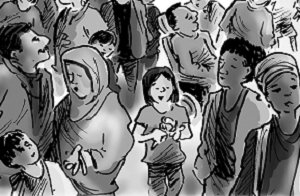 But Indonesia itself may be stepping up more to promote its language outside of its borders. Unlike Chinese with the Confucius Institute, French with the Alliance Francaise, Italian with the Istituto Italiano di Cultura and so on, Indonesia has no funded institution devoted to promoting its language and culture overseas. There are rumours that Indonesia will open a Balai Bahasa Indonesia in Australia which would be a huge boost to the language in Australia. The two BBIs in Australia that exist in the ACT and Perth were founded independently and do great work promoting the language and developing ties between the two countries. If you’re an Indonesian teacher, what’s your reaction to the Australian Curriculum? Are you positive about the outlook for Indonesian study in Australia?